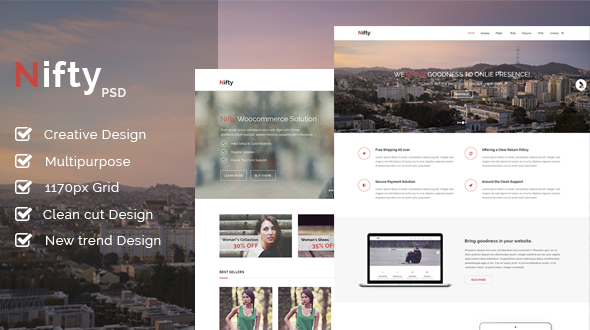 Nifty Is a clean cut modern multi-purpose PSD template. Nifty Template design on the concept of new Web Design Trend. We have take care of design to suit on any type of website even its a personal, business or online shop its will make website nifty. The design of Nifty template is simple, user friendly and eye catching its will let to users to feel good when they are on your website. 18 Fully Layered and Editable Adobe Photoshop (PSD) files. WordPress and HTML version coming soon. Follow us on facebook, twitter or G+ for updates.